I am excited to let you guys know that I am partnering and in an affiliate program with FabFitFun. So, I am going to start with unboxing this FabFitFun Summer 2017 Summer Box. 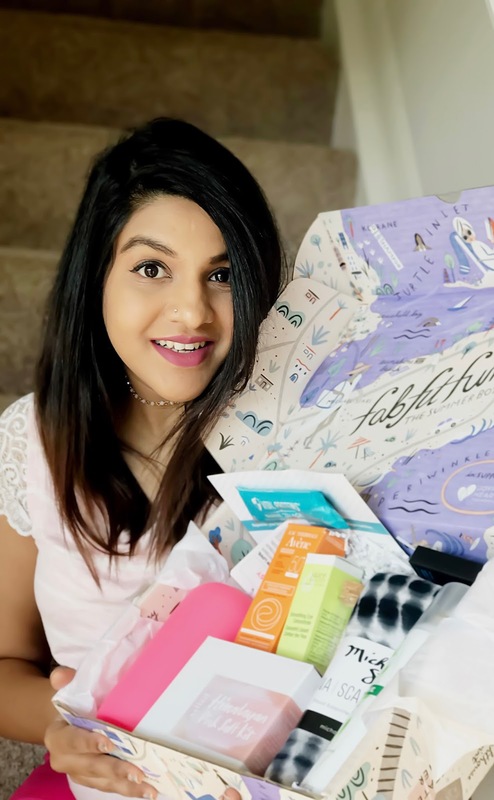 I have never done review on any of my subscription boxes until now but I was stoked on this box because, I have kept seeing people unboxing it and I really wanted to try one. Basically they are seasonal boxes, so they have summer, fall, winter, spring and this comes with products worth $200. The best part is that it has all full size products and it's just $49.99, but if you use my coupon code and it's your first time getting the box then its just $39.99. I received this FabFitFun Box last week : The FabFitFun Summer 2017 Box ! This is by far one of my favorite subscription service of all the ones I have tried. So I am going to jump right in and show you what all I got in my box, because this a really good one. If you open it up, it's got a really cool packaging which looks really summery. First thing you get is this little Vitals Proteins Marine Collagen sample, which is basically an unflavored drinkable collagen powder that can be added to any beverage, hot or cold, for a healthier complexion. It contains 10 grams of natural collagen protein in each serving and it's gluten free, sugar free and Non -GMO. This is one of the item I was really stoked on and one of the reasons I wanted to try this box. This BKR bottle is really very pricey, I wanted buy one during this pregnancy as I have to drink loads of water, but since they are pricey I was waiting to get one when I get a deal. They are glass bottle which can be refillable and they come with this silicon outer layer, so if you drop them it protects from breaking. These are great for gym but I use it everyday to keep a track of my water intake. These are very pricey so, getting them in a box like this is worth a deal. The other product I was excited to try was this Micheal stars scarf or sarong or rauna, and this is a pricey product too. So, the bkr bottle and this scarf alone costs more than the box value and I have no idea how do they do it. It can be worn as a scarf or as a beach cover up too. So there are couple of different ways you can use it and must say it's really soft. The next product is this Kris Nations Necklace, it comes in this cute like message in a bottle. It is handmade and assembled in India . The Juice Beauty Smoothing Concentrate moisturizes and soothes dark circles and fine lines. It has organic grape and carrot juices blended with essential fatty acids to hydrate and nourish the eye area. So, this Avene Sunsceen protects and nourishes your skin and it is also sheer and lightweight. It contains broad spectrum SPF 50+ UVA/UVB filters and is enriched with powerful antioxidant and soothing Avene Thermal Spring Water. This Cargo HD Highligter is originally formulated for high definition filming. It is formulated to look invisible on the skin to high definition cameras. I love this Klorane Dry Shampoo, as this is the only dry shampoo I have been using since it was out. I was kind of excited that my box had a full size of this one. This dry shampoo has a powerful cleansing action and natural absorbent microspheres which eliminates dirt, oil and orders. A quick spray and my hair regains volume and texture without any white residue. The Himalayan Pink Salt Kit comes with a grater, wood stand and a block of pink salt that you can use it in your food. The total retail value of this box was around $272 - $287 (depending on the selections you received). I am glad that I bought this box and I received all these variety of products included in it. I would highly recommend this FabFitFun Box to everyone. I am super excited for the next box and you guys can get your first box with $10 off using the code or link below. 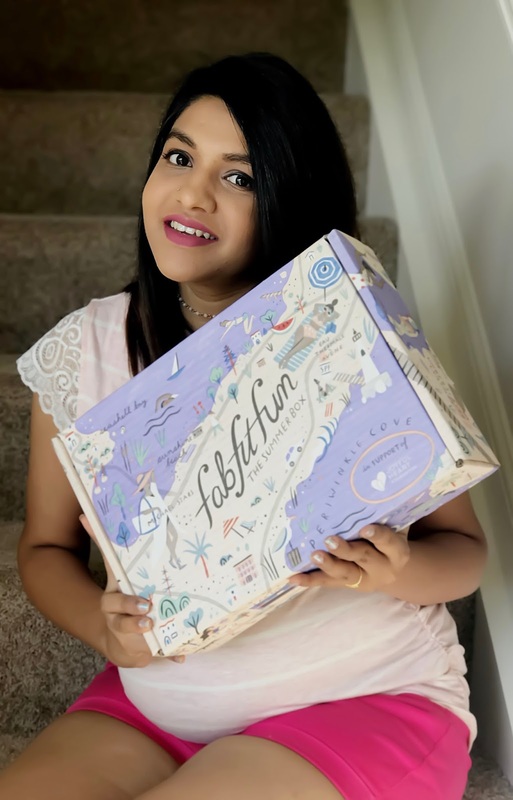 Let me know what did you all think of the FabFitFun Box? Thank you in advance if you decide to use one of my links to make your purchase. I appreciate your support. *DISCLAIMER*: The opinions expressed are true and my own. Thank you for supporting what I do!! What a great kit! Looks like you got so many goodies -- I love that Avene sunscreen, so I know that is a keeper, for sure! Water bottle so I am going to check out this subscription! Looks like you got some good stuff! I love the necklace that you got! What an amazing collection! There is something so exciting about getting goodie box filled with surprise items :) By the way, that dry shampoo is the best. My favorite! Every 3 months I see this, and every 3 months I tell myself I gotta get subscribed xD one day!! So many goodies! I love that Kris Nations necklace! Wow, looks like you got a ton of goodies! I'm definitely checking this box out, might be fun to get! I'm definitely interested now that I see what's in the box. I could use help finding different products that are high quality and actually good for you. Seems like a good product! I've been interested in this box,!! All the goodies you got look so amazing!! Love what came in this box this month! Love the water bottle too! Defiantly worth the value in this box this month. My girlfriend gets these boxes and she loves them every month as well. Great post! I always love the unboxing posts with Fab Fit Fun. Their stuff is so awesome! I definitely need to try out this subscription! This box looks so awesome! I love the water bottle, I've been looking for a bigger one!